The architect who build St Nicholas’ Russian Orthodox church was being supervised by A Smirnov, who was building the Aleksander Nevsky Cathedral a few blocks away. 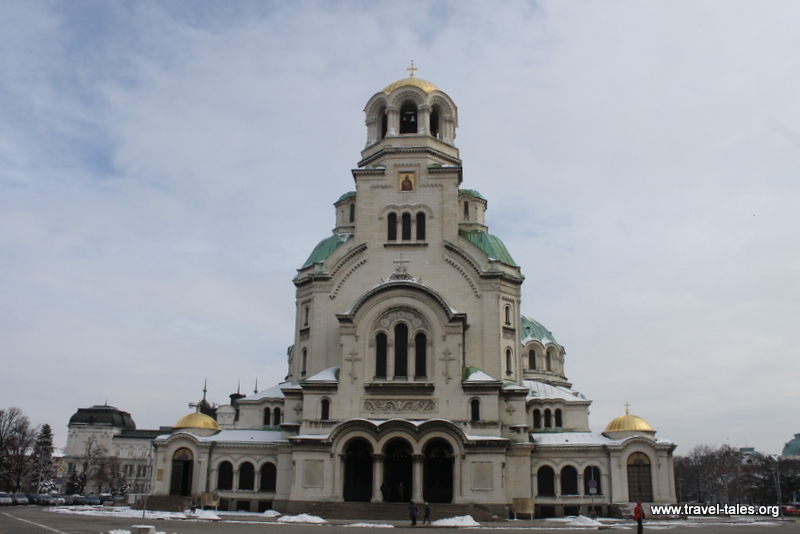 This is a Bulgarian Orthodox cathedral and is home to the Patriarch of Bulgaria. Its architecture from the outside is quite remarkable and distinct, with a number of domed roofs covered in gold or copper. The layout is quite different to what I have come to expect in churches, less of a long aisle and crossing knave, rather a number of different altars at which to worship and pray. The ceilings above the entrances are very intricately decorated in gold and coloured mosaic images of saints. Inside it is even more amazing. I decided initially to explore without permission to take pictures (which I would have had to pay for) and the more time I spent inside admiring the floor to ceiling wall paintings, the more I felt that I wouldn’t be able to take good pictures of them. The cathedral is lit by giant chandeliers, and although the candles have been replaced with electric bulbs, they are not very bright. Without a flash, I don’t think I would have been able to capture any of the decoration and a flash would have given uneven illumination to the full walls and ceiling. I had expected to be able to buy postcards of professionally taken pictures of the interior and was happy to pay for them, but alas, the shops at the entrance to the cathedral sold mainly icons and candles and some not very inspiring postcards. You may notice from that picture and in the outline above that there are no pews. The congregations stands during liturgy at the cathedral. I don’t know how long it is, but clearly no nodding off at the back of church possible here!